NewsDaily: World Bank issues SOS for oceans, backs alliance. SINGAPORE, Feb. 24, 2012 (Reuters) — The World Bank announced on Friday a global alliance to better manage and protect the world’s oceans, which are under threat from over-fishing, pollution and climate change. Does Your Hospital Publish Their Prostate Cancer TX Results? We do. Free Hard Drive and Free Shipping. Six Months No Payment. Buy Today! Custom designed thermal and catalytic oxidizers! Find Out How To Get Your Insulation Rebate From New Mexico Gas Company! Oceans are the lifeblood of the planet and the global economy, World Bank President Robert Zoellick told a conference on ocean conservation in Singapore. Yet the seas have become overexploited, coastlines badly degraded and reefs under threat from pollution and rising temperatures. “We need a new SOS: Save Our Seas,” Zoellick said in announcing the alliance. The partnership would bring together countries, scientific centers, non-governmental groups, international organizations, foundations and the private sector, he said. The World Bank could help guide the effort by bringing together existing global ocean conservation programs and support efforts to mobilize finance and develop market-mechanisms to place a value on the benefits that oceans provide. Millions of people rely on oceans for jobs and food and that dependence will grow as the world’s population heads for 9 billion people, underscoring the need to better manage the seas. Zoellick said the alliance was initially committed to mobilizing at least $300 million in finance. A key focus was understanding the full value of the oceans’ wealth and ecosystem services. Oceans are the top source of oxygen, help regulate the climate, while mangroves, reefs and wetlands are critical to protecting increasingly populous coastal areas against hazards such as storms — benefits that are largely taken for granted. “Whatever the resource, it is impossible to evolve a plan to manage and grow the resource without knowing its value,” he said. Another aim was to rebuild at least half the world’s fish stocks identified as depleted. About 85 percent of ocean fisheries are fully exploited, over-exploited or depleted. “We should increase the annual net benefits of fisheries to between $20 billion and $30 billion. We estimate that global fisheries currently run a net economic loss of about $5 billion per year,” he said. Participants at the conference spoke of the long-term dividends from ocean conservation and better management of its resources. But that needed economists, bankers and board rooms to place a value on the oceans’ “natural capital”. “The key to the success of this partnership will be new market mechanisms that value natural capital and can attract private finance,” Abyd Karmali, global head of carbon markets at Bank of America Merrill Lynch, told Reuters. He pointed to the value in preserving carbon-rich mangrove forests and sea grassbeds and the possibility of earning carbon offsets for projects that conserve these areas. “The oceans’ stock is in trouble. We have diminished its asset value to a huge degree and poor asset management is poor economics,” Stephen Palumbi, director of the Hopkins Marine Station, Stanford University, told the conference. How the U.S. Could Pressure North Korea Tomorrow: Quit the $100 Bill; North Korea is minting superdollars | Business | TIME.com. These ultra-counterfeits are light years beyond the weak facsimiles produced by most forgers, who use desktop printers. As an anti-counterfeiting investigator with Europol once put it: “Superdollars are just U.S. dollars not made by the U.S. government.” With few exceptions, only Federal Reserve banks equipped with the fanciest detection gear can identify these fakes. Yet as unpatriotic as this may sound, perhaps America would be better off if Kim Jong Un were to try and enrich himself with D-I-Y Benjamins. Let me explain, by way of a little background about superdollars. The “super” moniker does not stem from any particular talent on the part of the North Koreans. It’s a matter of equipment. The regime apparently possesses the same kind of intaglio printing press (or presses) used by the U.S. Bureau of Engraving and Printing. A leading theory is that in 1989, just before the collapse of the Berlin Wall, the machines made their way to North Korea from a clandestine facility in East Germany, where they were used to make fake passports and other secret documents. The high-tech paper is just about the same as what’s used to make authentic dollars, and the North Koreans buy their ink from the same Swiss firm that supplies the US government with ink for greenbacks. Superdollars can be viewed as an act of economic warfare, but Pyongyang’s motive is probably more mundane: The regime is broke. The 2009 attempt to raise funds by devaluing its already pathetic currency revealed not only the country’s fiscal desperation, but also the abuse Dear Leader was willing to inflict on his people. The won was devalued 100-fold, which meant 1,000 won suddenly had the purchasing power of 10 won. (Imagine waking up to a learn that a slice of pizza costs $250.) Officials set a tight limit on how much old money could be exchanged for new, so whatever value existed within people’s paltry savings evaporated overnight. Compared to devaluation, generating quick cash by counterfeiting some other country’s more stable currency looks downright humanitarian. The superdollar affair has a certain comic-book quality: copying the currency of the evil capitalists so you can buy cognac and missiles. But Washington isn’t laughing. At the end of December, Ireland’s high court rejected a U.S. request to extradite former Workers Party president and IRA veteran, Sean Garland, for his alleged involvement with the superdollar plot. There is also the question of what exactly the North Koreans hope to procure with all of this “money.” According to the House Task Force on Terrorism and Unconventional Warfare, superdollars may be part of the regime’s effort to acquire materials for nuclear weapons. Since the superdollars were first detected about a decade ago, the regime has been pocketing an estimated $15 to $25 million a year from them. (Other estimates are much higher—up to several hundred million dollars’ worth.) That sounds like a lot of money, but compared to the $1 trillion in cash circulating in the great ocean of commerce, a few hundred million is chump change. Although certainly costly for small business owners who unknowingly accept a bunch of forgeries, counterfeits probably won’t bring about a crisis of faith in our paper money anytime soon. Superdollars, and the untold billions of (electronic) dollars spent combating them could be the wake-up call that finally forces us to think more clearly about the costs of physical money. If killing all cash strikes you as a little too radical, consider for a moment what it would mean to get rid of high-denomination banknotes. Who would be most inconvenienced if Washington were to outlaw $100 and $50 bills tomorrow? Cartel bosses in Juarez, Mexico jump to mind. So do human traffickers in China and Africa, aspiring terrorists in Afghanistan, wildlife poachers, arms dealers, tax evaders, and everyday crooks who hold up mom and pop groceries. And, or course, North Korean government officials. So then. At the risk of infuriating cash-hoarding militia members, anonymity-obsessed ACLU’ers, the U.S. Treasury, Russian mob, Laundromat owners, and just about every person who has ever hid a purchase from a spouse or income from the government, I would say this to Kim Jong Un and his posse of counterfeiters: Bring it. Record Runoff into the Missouri Basin : Image of the Day. As floods along the Mississippi River began to recede, waters rose along the Missouri River. Extending across 10 U.S. states, the Missouri drains nearly one-sixth of the area of the United States. In June 2011, above Sioux City, Iowa, the Missouri River Basin experienced the highest runoff for any single month since the U.S. Army Corps of Engineers (USACE) began keeping detailed records in 1898. Multiple factors contributed to the heavy runoff into the Missouri River Basin, the USACE explained, including heavy snowpack on the plains, near-record snowpack in the western U.S. mountains, and rainfall. This color-coded map shows rainfall anomalies for May 2011, compared to the 1998–2010 average. Below-average percentages are brown, and above-average percentages are blue. Rivers are thin blue lines. 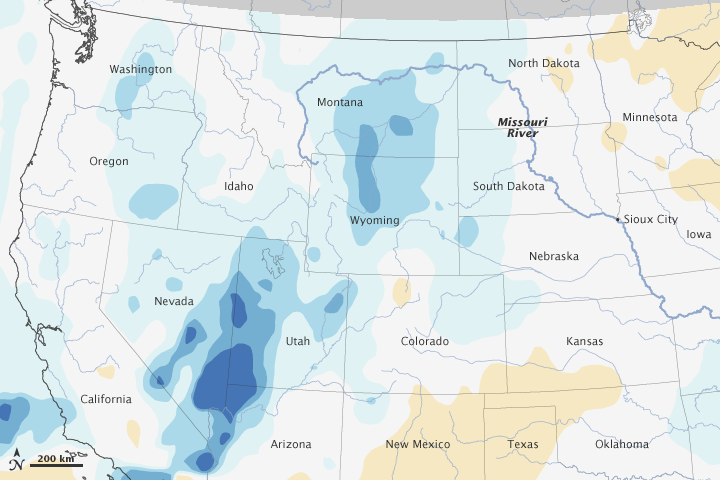 Blue dominates most of the western United States in this color-coded map, testifying to the unusually high rainfall in May 2011. The USACE characterized the rainfall into the upper Missouri River Basin in mid- to late May as a critical factor in subsequent runoff. In May 2011, eastern Montana received 300 to 400 percent of normal rainfall, with some locations receiving more than a year’s average rainfall in just two weeks. Parts of North and South Dakota and Wyoming received more than 200 percent of normal rainfall. In some places, heavy rain continued into June. By June 2011, the heavy rain had translated into heavy runoff. That month, the USACE reported, runoff into the Missouri River Basin above Sioux City totaled 13.8 million acre feet. (An acre foot is the amount of water required to cover one acre with one foot of water.) It was enough water, the USACE explained, to fill Memorial Stadium in Lincoln, Nebraska, every five minutes throughout the month of June. The previous record monthly runoff for the Missouri River Basin above Sioux City was set in April 1952, at 13.2 million acre feet. In 2011, the combined runoff for May and June was 24.3 million acre feet, just below the normal annual runoff total of 24.8 million acre feet. Not all of the western United States was soggy in May 2011. In this image, a brown patch of below-average rainfall extends from southern Colorado and Kansas into New Mexico and Texas. This region experienced deepening drought as the summer of 2011 progressed. This image is based on data from the Multisatellite Precipitation Analysis produced at Goddard Space Flight Center, which estimates rainfall by combining measurements from many satellites and calibrating them using rainfall measurements from the Tropical Rainfall Measuring Mission (TRMM) satellite. National Weather Service. (2011, July 22). Missouri Basin, Pleasant Hill. Accessed July 22, 2011. U.S. Army Corps of Engineers. (2011, July 11). Corps: June 2011 was highest single month of runoff into Missouri River basin. (PDF file) Accessed July 22, 2011. U.S. Drought Monitor. (2011, July 14). Conditions for July 12, 2011. (PDF file) University of Nebraska, Lincoln. Accessed July 22, 2011. U.S. Geological Survey. (2009, September 8). Missouri River. Accessed July 22, 2011. NASA Earth Observatory image by Jesse Allen, using near-real-time data provided courtesy of TRMM Science Data and Information System at Goddard Space Flight Center. Caption by Michon Scott. Ice Island Calves off Petermann Glacier : Natural Hazards. In August 2010, the Petermann Glacier along the northwestern coast of Greenland calved an ice island roughly four times the size of Manhattan. 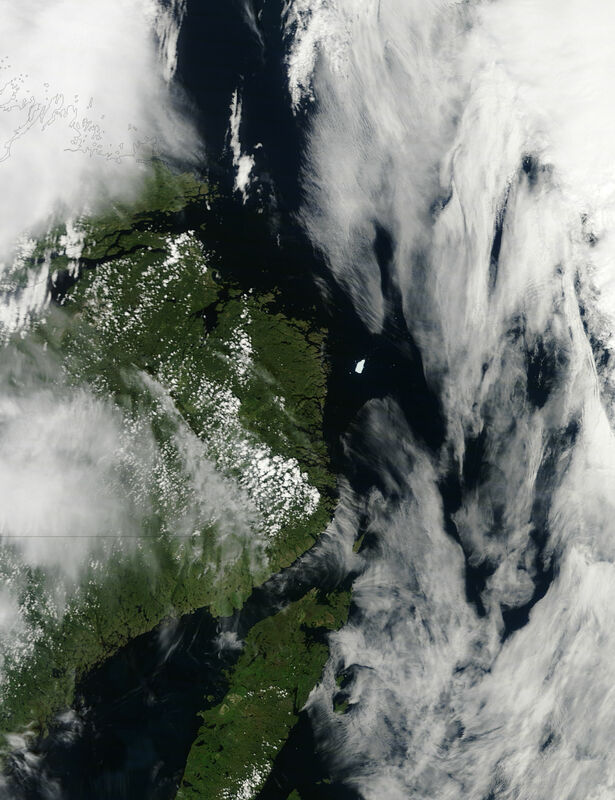 Nearly a year later, on July 20, 2011, a piece of that ice island—named Petermann Ice Island-A (PII-A) and about the same size as Manhattan—was still visible to the Moderate Resolution Imaging Spectroradiometer(MODIS) on NASA’s Terra satellite. The Canadian Ice Service (CIS) tracked the ice island as it drifted through the Labrador Sea. 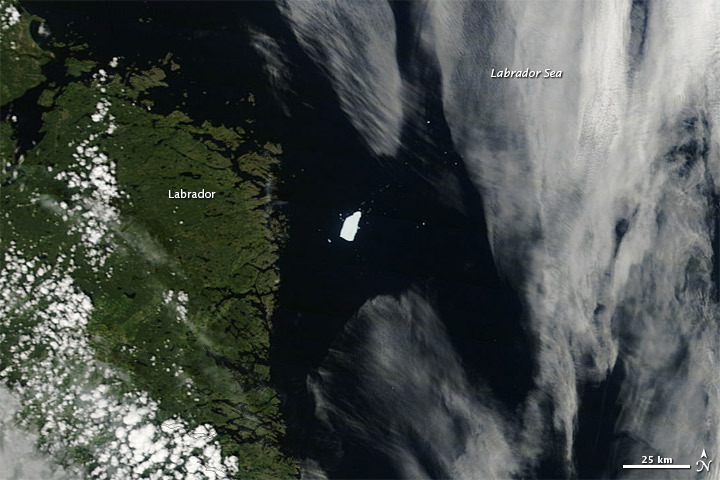 On July 8, 2011, the CIS reported that the PII-A was approximately 55 square kilometers (21 square miles), and was continuing to lose surface area through calving and melting. On July 20, MODIS observed PII-A slightly south of where it had been a month earlier. On July 21, 2011, MSNBC reported that PII-A was slowly drifting toward Newfoundland. The glacier was not likely to reach land; its base would probably become grounded on the sea floor off the coast. The ice chunk did, however, pose a potential hazard for shipping lanes and offshore oil rigs. Canadian Ice Service (2011, July 8). Petermann Ice Island Updates. Accessed July 22, 2011. MSNBC. (2011, July 21). Massive ice island drifts toward Canada. Accessed July 22, 2011. NASA image courtesy Jeff Schmaltz, MODIS Rapid Response, NASA Goddard Space Flight Center. Caption by Michon Scott. Horn of Africa Famine: Millions at Risk in “Deadly Cocktail” of War, Climate Change, Neoliberalism. The mask slips : Nature : Nature Publishing Group. It says a lot about the outcome of the UN climate talks in South Africa at the weekend that most of the immediate reports focused on the wrangling that led to an agreement of sorts, rather than the contents and implications of the agreement itself. Late-night talks, later-night arguments and early-morning pacts between battling negotiators with the apparent fate of the world resting on their shoulders give the process a melodrama that is hard to resist, particularly for those who experienced it first hand in the chaos of the Durban meeting (see page 299). Such late finishes are becoming the norm at these summits. Only as nations abandon their original negotiating positions and reveal their true demands — throwing international differences into stark relief — does a sense of urgency develop and serious negotiation take place. Combined with the consensus nature of the talks, which demands that everyone agrees to everything, the result is usually a cobbled-together compromise that allows as many countries as possible to claim victory and, most importantly, provides them with a mandate to reconvene in 12 months’ time. So it was this time. In the search for a successor to the Kyoto Protocol, we now have the Durban Platform, which comes on the heels of the Bali Road Map and the Copenhagen Accord. It takes a certain kind of optimism — or an outbreak of collective Stockholm syndrome — to see the Durban outcome as a significant breakthrough on global warming, as many are claiming. Outside Europe — which has set itself binding emissions goals over the short and long term beyond what it will inherit under its stated plan to carry on with unilateral cuts under an extended Kyoto — there will be no obligation for any nation to reduce soaring greenhouse-gas emissions much before the end of the decade. And that is assuming that all flows smoothly in future UN talks, and that a global deal with binding commitments proves easier to find in talks due to start in 2015 than it has so far. The Durban deal may mark a success in the political process to tackle climate change, but for the climate itself, it is an unqualified disaster. It is clear that the science of climate change and the politics of climate change, which claims to represent it, now inhabit parallel worlds. This has always been true up to a point, but surely the mask of political rhetoric has now slipped so far, to reveal the ugly political reality underneath, that it can never be replaced. How can politicians talk now with a straight face of limiting global warming to 2 °C? How will campaigners frame this result as leaving yet another ‘last chance’ to save the planet? That does not make the political process redundant — far from it. Introducing policies to curb emissions was never about saving the planet or not, or stopping global warming or not. It is about damage limitation — the 3 °C or 4 °C of average warming the planet could experience in the long term, according to some analyses of the Durban outcome doing the rounds, is clearly much worse than the 2 °C used as shorthand for dangerous at present. But it is preferable to the 5 °C or 6 °C that science suggests is possible if emissions continue to rise unabated. To prevent that outcome will be just as difficult politically as was the now abandoned attempt to find a global successor in time to follow Kyoto. But it remains possible — and there were at least encouraging signs in Durban that previously obstinate countries recognize that it is necessary, even if it is delayed. Those, including this journal, who have long argued the scientific case for the need to control greenhouse-gas emissions should back this new political mood to the hilt. But as the Durban Platform crowds with politicians, the climate train they wait for has left the station. Well written editorial, and unfortunately too accurate. There is a theme arising out of Durban on the limits of legal-political processes, as well as the growing gap between scientific and political “realities”. How to bridge that gap, so we are not just mitigating significant harms to the world our children inherit, is the still-to-be-resolved challenge that requires work outside of the big conference halls. Time and growing GHG emissions are not waiting for any of us. The Nature editorial (Dec 15; The Mask Slips) talks about science and policy in parallel universes. Quite correct ? if you mean ?separate? and ?disconnected.? COP 17 was never about climate, let alone science. It was all about money: (1) How to assure continuing government careers for 200 delegations, with annual vacations paid by taxpayers. (2) How to transfer $100 billion a year from industrialized nations to LDCs (or more precisely, to their kleptocratic rulers), using ?climate justice? or ?climate guilt? (depending on who is doing the talking). (3) How to gain a national advantage by setting differential emission limits. By now it should be obvious that (1) the enshrined temperature limit of +2degC is based on fiction and has no scientific basis. As an annual global average, climate models tell us, it will mean warmer winter nights in Siberia and Canada; perhaps -35deg instead of -40; and little warming in the tropics. (2) It should also be obvious that even strenuous and economy-killing efforts at mitigation, will have little effect on atmospheric levels of carbon dioxide, let alone on climate. If a demonstration is needed, just look at the lack of warming since 1998, in spite of rapidly rising levels of greenhouse gases. So, yes, I would agree with the editorial, if properly expanded. Yes, great editorial. Coming from the world’s leading scientific journal (which of course would prefer not to have to say such things) one would hope that authorities and media around the world take significant notice. Thinking about the whole UN climate negotiation process, and how complex and cumbersome it is to seek unanimous agreement from 194 countries…. Then comparing what has come out of the COP17 cycle – significant and landmark progress, even if still sharply insufficient to the urgency of need – to what has come out of the U.S. Congress over the last several months or more, with its supposedly streamlined and results-oriented binary democracy approach – practically nothing. And suddenly – surprise! – consensus (in this entirely limited comparison) looks pretty darn effective – just from a simple results-accomplished perspective. For which differential, there is, in turn, good scientific reason. No, there are no parallel worlds – the science and politics of AGW share the same scam. Spare us the crap about 6 degree C temperature rise , when you know that this is a lie. No temperature rise for a decade! The science and politics are about money – the greatest swindle since the South Sea Bubble. Hundreds of billions of dollars are to be given to African despots, conmen, swindlers and bankers for a scientific fanatsy. These beneficiaries will live in luxury in their Mediteranean villas while the poor of the third world countries and developed countries will be the sufferers, and pay the price. Please get real, Nature Editor. I think it is very clear that the “global consensus” approach to dealing with climate change has failed. I may be time for those countries who are willing to do something about it to band together and go it alone. And then start charging tariffs on any goods imported from countries not part of the coalition, proportional to the amount CO2 pollution caused by those countries. If we can get Europe, Africa and the island nations on board, I don’t think it would take too long for China and India to follow suit. I do not subscribe to the concept of global warming induced by human activities. About a 1,000 years ago Greenland was green and cows brought by the Vikings polluted the clean Arctic air. Instead of global warming Greenland got frozen till today. I often go to The Canadian Arctic and indeed can testify that the mean temperatures in July are higher than previously (~10 years ago), and though my Inuit friends blame the US government, I argue and try to persuade them their view is wrong. Michael Lerman, Ph.D., M.D. I find this comment in the article troubling: “Those, including this journal, who have long argued the scientific case for the need to control greenhouse-gas emissions should back this new political mood to the hilt”, especially when you say something like ” there were at least encouraging signs in Durban that previously obstinate countries recognize that it is necessary, even if it is delayed”. To me, this bodes ill for an open minded and unbiased editorial policy! The COP people have been at it for a long time! I would think that if the science is solid, then the arguements would have moved foreward, at least a little. Instead, we are still talking about the evidence of global warming, and how to mitigate against it. AGW is all based on atmospheric rise in CO2 that was put there by human activity.So, now we have closed the talks in Durban, still with no agreement on the cause of the increased CO2 that will, someday, maybe, eventually, turn the world temperatures a little warmer. Not in my lifetime; maybe not even in yours! 2) Since water retains less CO2 when it is heated, how can the worlds oceans be both warmer and more acidic at the same time? CultureLab: How to make steel go green – with songs!. This is something you don’t see every day: a substantial, carefully-researched book on how to reform our manufacturing industries, paired with an album of songs on the same theme. Let’s start with the book. Sustainable Materials: With Both Eyes Open tackles a particularly thorny question: how can we cut our greenhouse gas emissions to a safe level, without shutting down essential industries? It focuses on steel and aluminium, which between them account for 28 per cent of all industrial emissions, although later chapters briefly consider cement, paper and plastics as well. This is a follow-up book to David MacKay’s much-vaunted Sustainable Energy – Without the Hot Air. Both feature academics from the University of Cambridge carefully working out how we can transform an emissions-heavy sector of the economy. The eight authors, led by Julian Allwood and Jonathan Cullen, first take a close look at how steel and aluminium are produced from their respective ores, asking “how much can the metals industry do to clean up its act?” The answer they come up with: “plenty, but nowhere near enough”. So they take a second approach, asking whether we can redesign the things we make to use less metal, use them for longer, and recycle their components when they wear out. This also offer plenty of options. Reassuringly, when the two approaches are combined the total emissions cuts are substantial. Some of the ideas they come up with are so simple, I wondered why no one thought of them before. For instance, the average fridge lasts about 10 years, and gets thrown out when the compressor fails. This is a small part, but it takes a lot of work to replace so it’s cheaper to buy a new fridge. If fridges were redesigned so that the compressor was easy to replace, they would last far longer. “You shouldn’t have to buy two fridges in your lifetime,” they say. Of course, this is another example of a solution for climate change that involves huge numbers of people taking concerted action. The problem is people’s disinclination to get off their backsides. It’s quite a technical book, so it may not have much popular appeal, despite its nicely chatty style. But for policy-makers trying to cut emissions, and anyone in manufacturing, it should be required reading. And so to the album, a collaboration between Allwood and soprano Adey Grummet, which is much better than it has any right to be. Worthy music on eco-conscious themes can sound like Spinal Tap’s Listen to the Flower People, but With Both Eyes Open actually contains a couple of good tunes. The strongest songs get away from the details of materials science and become universal. The opening track, You Gotta Start, is an up-tempo number extolling the virtues of having a go, even when you don’t know exactly what you need to do. It’s not just about sustainability. Similarly, the title track is a passionate call to arms, urging people to move away from blind consumerism. The closing line – “the stuff of life is life and not just stuff” – is better and more relevant than anything Coldplay will write next year. Given how specialist the subject matter is, I’m not sure how many people the album will really appeal to. Of the 12 songs, I only expect to keep the two I’ve highlighted on my MP3 player. Unfortunately, the rest just restate ideas from the book in a slightly less clear way. I worry that the album will give people, particularly policy-makers, the impression that the book is somehow flaky and not worth paying attention to. That would be a crying shame, because the book’s lessons are clear, well-supported, and vital. Battery Fires Reveal Risks of Storing Large Amounts of Energy: Scientific American. People still need electricity when the wind isn’t blowing and the sun isn’t shining, which is why renewable energy developers are increasingly investing in energy storage systems. They need to sop up excess juice and release it when needed. However, storing large amounts of energy, whether it’s in big batteries for electric cars or water reservoirs for the electrical grid, is still a young field. It presents challenges, especially with safety. The most recent challenge first appeared in May, three weeks after a safety crash test on the Chevrolet Volt, General Motors Co.’s plug-in hybrid. The wrecked vehicle caught fire on its own in a storage facility, raising questions about its lithium-ion battery. Last week, after a series of additional side-impact crash tests on the Volt battery, the National Highway Traffic Safety Administration (NHTSA) launched what it called a “safety defect investigation” into the risk of fire in a Chevy Volt that has been involved in a serious accident. Problems have also afflicted spinning flywheels, which allow power plants and other large energy users to store and release powerful surges of energy. In Stephentown, N.Y., Beacon Power’s 20-megawatt flywheel energy storage facility suffered two flywheel explosions, one on July 27 — just two weeks after it opened — and one on Oct. 13. The company declared bankruptcy earlier this month. In Japan, sodium-sulfur batteries at Mitsubishi Materials Corp.’s Tsukuba plant in Ibaraki prefecture caught on fire on Sept. 21. It took firefighters more than eight hours to control the blaze, and authorities declared it extinguished on Oct. 5. NGK Insulators Ltd., the company that manufactured the energy storage system, said it is still investigating the incident’s cause and has halted production of its sodium-sulfur cells, which are installed in 174 locations across six countries. “Clearly, storing large amounts of energy is difficult from a physics standpoint; [the energy] would rather be somewhere else,” said Paul Denholm, a senior energy analyst at the National Renewable Energy Laboratory. He explained that energy naturally wants to spread out, so packing it into a small space like a battery or a fuel cell creates the risk of an uncontrolled energy release like a fire or explosion. Similar issues come up with mechanical storage, whether it’s water behind a dam, compressed air underground or spinning flywheels. However, these risks are not unique to storing electricity. Fossil fuels, which are technically forms of stored energy, pose plenty of problems in their extraction, refining, distribution and delivery. “We basically have grandfathered these risk factors. Gasoline catches on fire all the time,” said Denholm. Electrical energy storage systems aren’t inherently riskier than petroleum or natural gas, according to Denholm, but their risks are different. This condition, known as a thermal runaway, happens when a cell fails and releases its energy as heat. This heat can cause adjacent cells to fail and generate heat, as well, leading to melting materials and fires. Controlling temperatures is relatively simple when the batteries are in a fixed location, say, next to a wind farm, but it becomes harder when they are placed in a car or bus. “The biggest thing that people become concerned about [for batteries in cars] is the ability to be able to tolerate abuse,” said Joe Redfield, principal engineer at the Southwest Research Institute, a nonprofit engineering research and development group. In a car, a battery is exposed to a wide range of humidities, temperatures and electrical loads. All of these factors influence the battery’s reliability, and if they get too extreme, they can cause a thermal runaway condition. This becomes a major problem for firefighters and first responders in the event of an accident involving lithium-ion batteries. Water can’t always be used to extinguish an electrical fire, since water can conduct electricity. In addition, in the case of a thermal runaway, it’s usually not the batteries that catch fire but their fumes, though lithium itself is flammable. Even after the fire is extinguished, the batteries can still generate tremendous amounts of heat and reignite fumes, hampering rescue efforts. One solution is to separate batteries into modules, making it easier to isolate a failed battery from the rest. Another trick is to have a master kill switch, a mechanism that quickly disables the electrical system and discharges the batteries. The Department of Energy and the National Fire Protection Association are working together to train firefighters and rescue workers to identify these switches in vehicles and grid storage systems as well as in how to respond to battery fires, according to the NHTSA. Redfield said that the best way to prevent such incidents is with a battery management system that evenly distributes electrical loads and controls temperatures. “It’s not just for safety; it’s primarily there to provide performance and battery life,” he said. “As the operating temperature increases, the lifetime diminishes dramatically. You want to ensure the longest battery life, and if you achieve that, then you’re clearly in the safety limits of the operating environment,” he added. Overall, Redfield expects that energy storage systems will help increase renewable energy use and curb fossil fuel dependence in the United States. The bumps along the road are significant, but they do not result from an inherent flaw in the idea. “Failures in new technology have almost always been the result of design shortcuts that were made in putting the new technology into progress. Every now and then, you have some uncharted territory — things we haven’t seen before — but typically, they are few and far between,” said Redfield. “It really is going down the same path we’ve gone down many times before. We don’t need to make the same mistakes we’ve made with liquid fuels.” After the earlier testing, NHTSA gave the Volt a five-star crash test rating — the agency’s highest — and it did the same for Nissan’s all-electric Leaf. Meanwhile, a second testing agency, the Insurance Institute for Highway Safety, has given the Chevrolet Volt a “G,” the highest safety score possible, after side crash tests on the front, side, rear and rollovers. Research by an affiliate of the insurance group, the Highway Loss Data Institute, estimates that overall chances of being injured in a crash are 25 percent lower in hybrids because their large batteries make them heavier than similar gasoline-powered cars.